I’ve built a Flyway Migrate step template for Octopus Deploy. 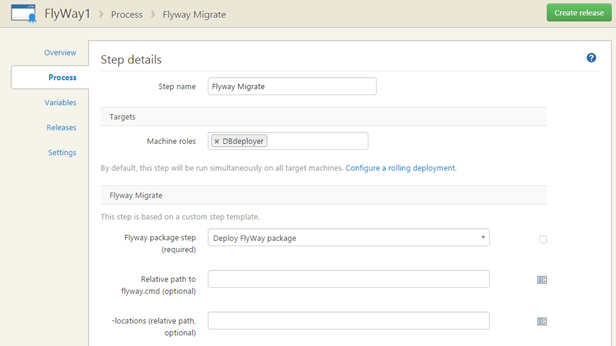 Allows you to easily migrate your Flyway project with Octopus Deploy. 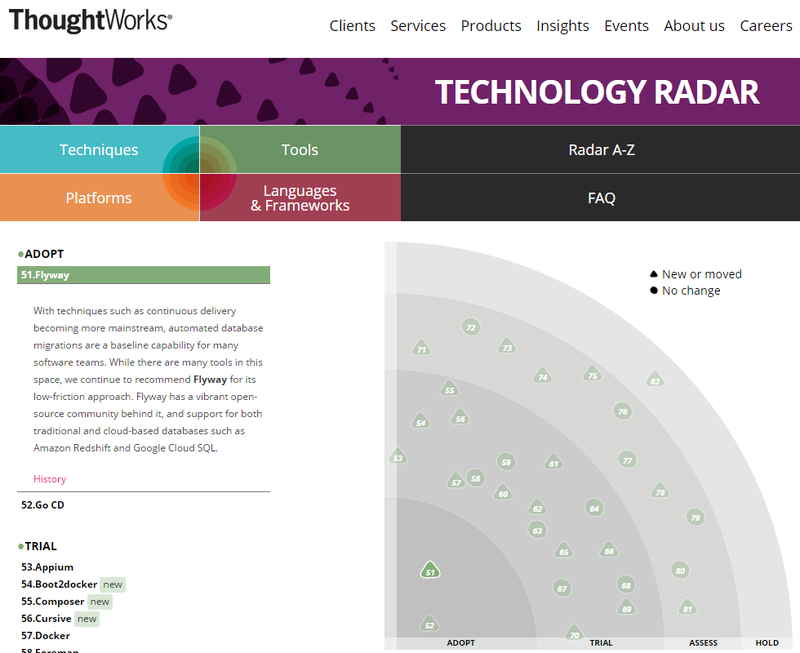 It also includes a drift check for the most popular database platforms using the Redgate comparison engines. For more detail about what it is, how it works and how to use it please read on. What is the drift check? How does the drift check work? How do I use the step template? Alex – you built it wrong! Flyway, built by Axel Fontaine (b|t), is a popular open-source migrations-based project format for Database Lifecycle Management (DLM). It’s a very simple tool that enables users to save a set of migration scripts and to automate the execution of them in sequence against target databases. It’s cross-platform, supporting most of the popular database platforms. The template includes a feature to manage a very common DLM problem: drift. This is where someone (or something) makes a change outside of your normal process. Perhaps it is a dev or manager with too much access to production? Perhaps it is a DBA who needed to fix a thing in a hurry? In either case drift causes problems. I’ve often ranted about the pros and cons of the migrations and state based approaches to DLM, but neither handle drift particularly well. For migrations based tools like Flyway, DbUp and ReadyRoll (among others) the problem is that the change is not detected. If a manual change is made to production and not copied into source control the production database will become out of sync with development and test machines. A migrations based approach will typically ignore this difference and carry on regardless. Over time environments become more and more inconsistent. Environment inconsistency is one of the biggest problems with delivering software. If anyone has ever told you “it works on my machine” you’ll probably appreciate that. If your production database is different from your test database you cannot trust your tests. If your source code is not consistent how can developers be confident that what they built will work in production? You’ll need to provide a ‘shadow’ database. This is a database that you are happy for Octopus/Flyway to clean (delete all the objects) and rebuild each time you deploy. We’ll use the Flyway “info” command to determine the version that the target database thinks it is up to. Then we’ll use the Flyway “clean” and “migrate” commands to rebuild the shadow database up to that point. You now have two databases that should contain identical schema objects. If they do not match your target database has drifted. You’ll provide the path to the command line for the appropriate comparison tool and then we’ll use it to check that the target and shadow databases are in fact in sync. If they are, fantastic, the deployment will continue as normal. If they are not in sync the deployment will fail, informing you that the drift check has failed. If the change is undesirable: roll it back. If the change is desirable: Add the changes to source control and promote them through your pipeline. Either of these actions should bring your environments back in line. The step template will help you whichever path you wish to take. The Redgate comparison tool will produce one or two artifacts depending on you RDBMS: driftReport.html and (for MySQL) undoDrift.sql. You can also point your Redgate comparison tool at the shadow and target databases to produce migration scripts in either direction that can be used to roll back drift (if the changes are undesirable) or to correct for it in your Flyway project (if the changes are desirable). Remember, if the changes are desirable, to also add this script to the Flyway “schema_version” table on the target databases and mark this script as deployed so that you don’t try to make the changes a second time next time you deploy! 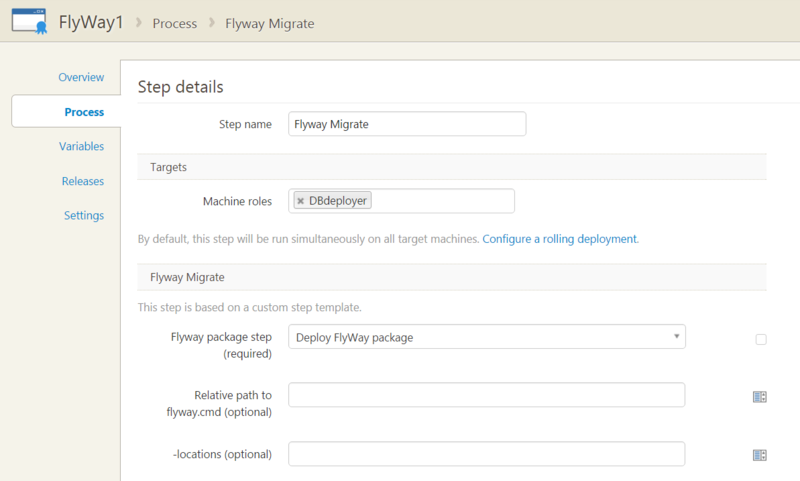 First of all go to the Octopus Deploy Library and select the Flyway migrate template. Follow the instructions to add this template to your Octopus Deploy server. You need to use NuGet to package your Flyway project. If you are using Octopus Deploy this is probably already second nature to you and ideally you have this happening automatically using a build server like TeamCity, Jenkins or VSO. You’ll need to include the full contents of the FlyWay project in your NuGet package. Once you can create packages and Octopus can pick them up open the process tab of your Octopus project. Add a step to your Octopus Deploy project to deploy your NuGet package to the target machine that hosts your database. (If you use any directories for your SQL scripts, other than the default /sql directory, list them here exactly as you would if you were calling Flyway from the command prompt with the –locations switch. You can stop here if you like and start deploying with Flyway right away. This much does not require any commercial licencing at all (other than your Octopus licence). If, however, you wish to run a drift check select the radio button. You’ll also need to provide the path to your Redgate command line tool as demonstrated in the screenshot below. The Redgate comparison tools all come with a free trial period but you will need to buy an appropriate licence once the trial expires. You’ll also need to provide connection details for a shadow database which will be used for the drift check (as explained above). Once you’ve done that you are ready to deploy with the added security and confidence that you will be alerted if any drift has occured. While I was building this step template a few of my colleagues were building “FlySQL”. FlySQL is a tool for Flyway users with MySQL databases that allows them to auto generate all their upgrade scripts at the click of a button. Once the script is generated the user can edit it should they wish. We are also planning to release this with a free community licence. Stay tuned for more info! If you find a bug in my code or you want me to change something leave a comment here or on the Octopus community library or tweet me and I’ll take a look. JSON for Octopus script doesn’t copy to clipboard. Is it available? I think that’s a browser issue. I’ve experienced it before. #WorksOnMyMachine with Chrome running on Win10. Can you expand to see the raw JSON? I make no promises to maintain that gist so if this comment is old when you read it please use the version on Octopus Deploy library instead (if possible). Great job on the step template, but i tried using it in conjunction with deploy an azure web app step but couln’t make it work due to the issue referenced in the link below. Hi Alex, Its is an excellent article. Thanks for sharing. I would like to ask one question. can we use SSDT SQL compare tool instead of Read gate. I have just done little research around it. I think we can achieve the same dirt check with sqlpackage. isn’t? I’m pretty sure that would work. When I originally created this I worked for Redgate, hence the tool choice. If I wrote it today I probably would have used dacfx/SSDT etc. It’s probably easiest to use Richie Lee’s dbatools cmdlets, but I’ve not checked that for sure. I would offer to look into it but I’m flat out for the next couple of weeks. Copyright © 2019 working with devs.... All Rights Reserved. Designed by bavotasan.com.